Romersk Kamomill har en örtig doft med varma undertoner, blommiga och lite gräslikande toppnoter. Romersk kamomill terapeutiska funktion påminner om både Blå Kamomill och Lavendel. Denna olja är värdefull för många hudproblem, särskilt där huden är mycket känslig, röd eller torr. Den är också väldigt bra vid smärta och värk. Kan också vara värdefull vid pms och menskramper. Den verkar lugnande och balanserande. Använd gärna i vegetabilisk olja för massage, hudvård och bad. Tips! Blandar sig bra med bergamott, olibanum och lavendel. Chamomile Roman essential oil is valuable for many skin problems, especially where the skin is very sensitive, red or dry. Its most important application is in the treatment of allergies, such as eczema, urticaria and all dry, flaky and itchy conditions, or those where patches of redness appear. It is used directly on the skin in aromatic waters, lotions and creams, but baths may be the simplest approach if a very large area of the body is affected. Chamomile Roman essential oil is produced by steam distilling the daisy-like flowering heads, pale blue to light green in colour and of a pourable viscosity. Chamomile Roman essential oil can be used in massage for muscular pain, and for inflamed joints in such conditions as arthritis. It is very effective in treating sprains, inflamed tendons, and swollen painful joints in bursitis (Housemaid’s knee, for example), always remembering that injuries and swellings must not be massaged, but a cold compress applied. Chamomile Roman is very calming on the mental/emotional level, and since many allergic reactions arise when the person concerned is under stress, it is far more valuable in treatment than any preparation which attempt to deal with the problem only as a skin eruption. It is important though to remember that there may be a ‘healing crisis’ in which the skin appears to get worse before it shows any improvement. This phenomenon is common to many forms of natural healing. 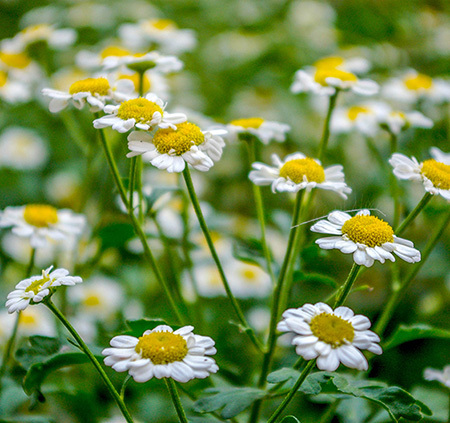 The action of chamomile as a local vasoconstrictor (i.e., it causes small blood-vessels to shrink) can help reduce the redness of cheeks due to enlarged capillaries, though it may be months before any improvement is seen. As suggested above, the mental and emotional effects of chamomile can be seen to parallel its physical effects, as with so many essential oils for it is soothing, calming and antidepressant and particularly helpful where stress or anxiety are inclined to make a person fretful, irritable or nervous. 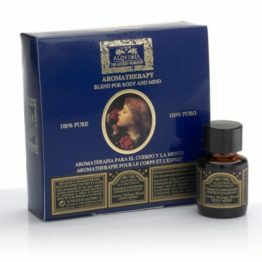 It is best used as a massage oil and in baths – perhaps blended with other oils. The most important actions of this essential oil are soothing, calming and anti-inflammatory, due to the presence in the oil of azulene. The exact chemical composition varies between the various types of chamomile. Chamomile Roman is one of the gentler oils, and is particularly suitable for treating children. Teething infants can be soothed by rubbing a little chamomile, diluted to 1 % into the cheeks. You might try a few teaspoons of weak chamomile tea, sweetened with a little honey, in a spoon or bottle, especially just before bedtime. Earache can be relieved by massaging around the ear, or applying hot compresses of chamomile. If the earache persists, or is recurrent, a doctor must be consulted.